In Mexico there are no legal national limits on continuous driving times — almost all OECD countries regulate driving hours and rest times for commercial drivers. Mexico has one of the poorest road safety records in OECD countries in terms of people killed and seriously injured per capita and per vehicle. A lack of resources to enforce regulation and inadequate co-ordination amongst agencies are common features in Mexico. 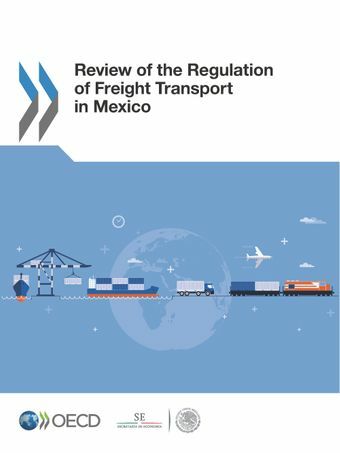 Mexico should increase the resources to enforce regulation, complete the fatigue regulation, introduce emission standards to import second-hand regulation and support public policies based on evidence (as the weight and dimensions standard). Mexico lacks capacity on hinterland connections to ports, and road connections appear more developed than rail. Main bottlenecks in ports are linked to controls and administrative procedures which increase burdens and restrict transport activity. Mexico should develop an integrated logistic strategy for the main Mexican ports to increase the volume; and increase port efficiency by establishing a free area of border controls for coastal shipping, introduce a specific regime to facilitate transhipment, expand opening hours of customs and inspection agencies; and simplify port gate operations. Auctioning rather than rationing is used to distribute slots in Mexico. This approach is a major departure from the internationally recognised guidelines. All regulation must be in Spanish and resources required to establish aviation standards are so large that often these can only be developed by international co-operation. Some of the international standards for aviation stipulate an official language to be used. Mexico should facilitate the implementation of auctions for primary slot allocation or replace the auction mechanism with international standards on airport slot allocation. It should publish aviation standards immediately in their original language in the Official Gazette, with acknowledgement that they are legally binding until replaced by official translations. It should be considered open skies agreements to accrue benefits in trade and tourism. Concessionaires need to negotiate compensation for interconnection services but if they do not reach an agreement the Mexico’s Ministry of Communications and Transport (SCT) can establish compensation and conditions of such services. The basis of such duty is unclear. Prices are set freely and the rail network was privatised to promote competition. A number of shippers have claimed that railway rates are too high. The government however, does not collect enough data or conduct the analysis required to determine access conditions and tariffs or where trackage rights are disputed. Mexico should develop the capacity to collect, provide and analyse the data needed to form judgments on competition issues and establish guidelines to determine conditions for the use of trackage rights in cases where agreement is not reached voluntarily.